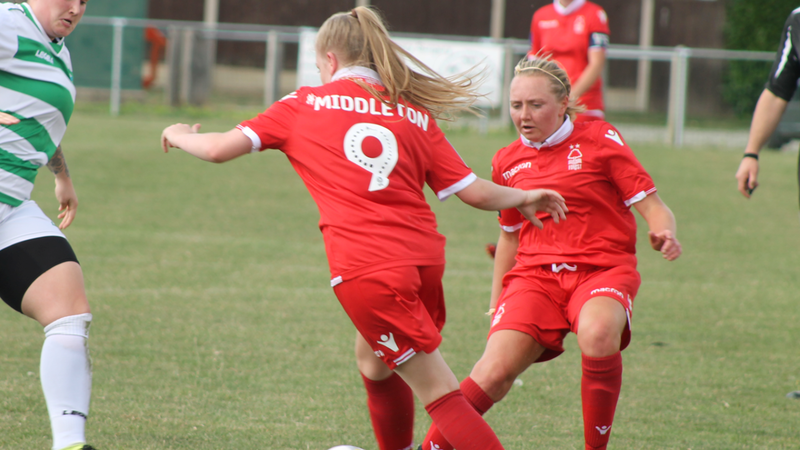 On Sunday, September 2 2018, TNS Ladies hosted Nottingham Forest Ladies at Foxen Manor, the home of Four Crosses FC. Unfortunately for Lawrence Wilson it wasn’t the result that he and everyone else wanted, as the Saints found themselves on the wrong end of a 3-0 scoreline in the FA Women’s National League Cup. Starting with a 4-3-3 formation, the visitors found themselves 1-0 up in the 13th minute. A long diagonal ball from the centre back was played in from the wing as the striker, Katie Middleton, tapped home. Great to see our young players as mascots today. Nineteen minutes later another similar ball out wide resulted in the second goal. Although the initial shot was saved, the rebound was bundled over the line as Forest established a comfortable lead going into the break. It was game, set and match in the 64th minute, when The New Saints lost possession on the edge of the box, resulting in a hat-trick for Katie Middleton. Great performance by the girls today shame about the result. We would like to wish @ForestLadies good luck for the rest of the season and in the next round of the league cup. TNS Ladies’ starting line-up: Garnham, Taylor, Parkes, Anderson, James, Lewis, Davies, Morris, Bebbington, Bragan, Ridge. Lead image credit: Nottingham Forest Ladies FC. Why not follow TNS Ladies on Twitter and keep up to date with all the latest news.